We have been in Long Beach for the last two weeks. It is sort of like coming home to me having lived in LA for a number of years, like 20 or something. We have been given use of a slip for our stay by the kind efforts of the Seal Beach Yacht club. It has been over six weeks plus since I got to do anything physical other than sail. Last weekend since I had transportation I wanted to go to Kyudo since I could visit with one of my favorite Kyudo instructors Jyozen Sensei. There wer classes both on Sat night and Sunday morning. We started out for class on Sat, however since we were running late and the traffic was going to make us later. It was decided to turn around and not go. I always think it is on the rude side to show up late for class. More so really late as we were to be. Sunday we got it together to make it to the early morning class in the park. This was a better class for me, since I had sent my knee pads off to Japan. We do not do the full TaiHai in the park. We do however do a meditation before shooting, as is done on the Sat class. I was asked to lead the meditation. This is my second time at this so was no big deal. 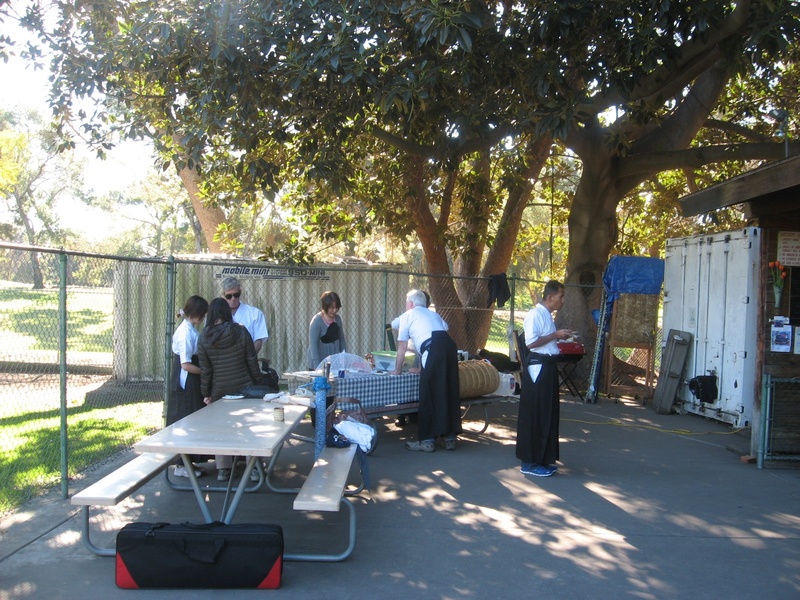 I had heard some comments before starting about just starting, since Jyozen Sensei was not there. However since I was ready to do the meditation we had at it. I kept in mind that some wanted to get at shooting, since our time was limited and just did a short meditation. We do standing shooting rounds with four arrows in the park sessions. This gives one a chance of a short warm up but still goes pretty fast as it is somewhat free shooting. I struggled with my shots. Feeling awkward from not shooting. However my main problem was not the lack of shooting, but having a Kake, that was too small. Surprising how wired that felt. I still was able to pull off some fair shots, but man o man I felt awkward . After I finished, Jyozen Sensei was there and came over saying , they told you to shoot bigger lat time right. I said yes, I thought so he said. I saw you struggling. Your base was good, but you kept going back and forth with you mind for base to hands, and did not really make your draw bigger. He then gave me some tips on understanding the push with the left to open the right and pull with the right to open the left principal. Also using the push of the left and the weight of the Yumi to raise and open my left arm in daisan. It helped, even with the small yukake I was able to shot better. However the small glove really really was a struggle. I thought when I was trying it on before buying this used glove it fit better. I was so wrong. I dropped a couple of arrows and my fingers felt like they had no control. Still I adapted and made a couple of fair shots. It was a good morning of shooting. I like shooting with this group. Next I need to get some TaiChi practice in. I have been getting stagnate on the boat. 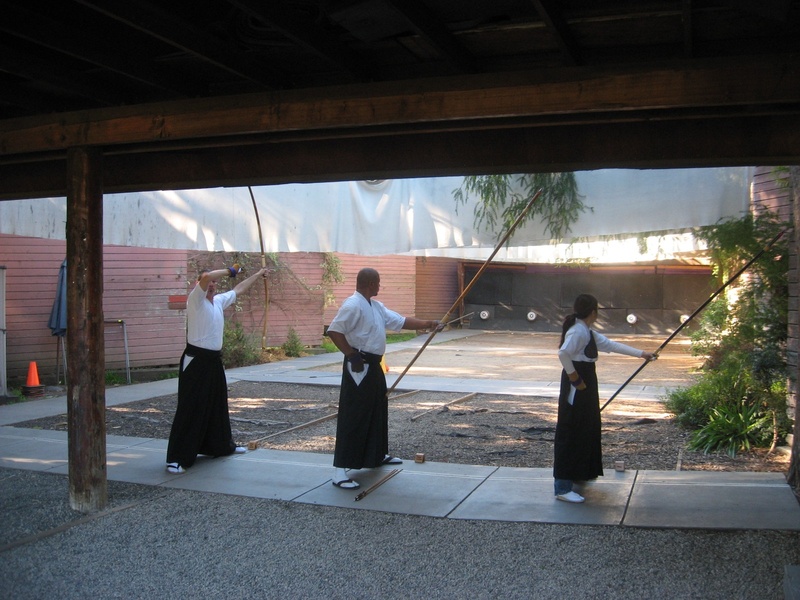 We will be in Mexico soon, and I can get a routine back, maybe I will be able to find a place to practice my Fu, and Kyudo. LA? Mexico? Aren’t you heading in the wrong direction? Glad you got in some Kyudo on your travels. By the way, sorry you had trouble with my blog comments. I’ve had a lot of spam recently and have had to activate comment moderating, so your comments will get published after I get notified by blogger via email. So it may take a while sometimes. Tai Chi Praying Mantis International Assoc. Check out the new Taiwan Academy website! I contributed to the translation under the Taiwan/Sinology Studies tab. Live As Is & Die As Is. "With hurricanes, tornados, fires out of control, mud slides, flooding, severe thunderstorms tearing up the country from one end to another, and with the threat of bird flu and terrorist attacks,"Are we sure this is a good time to take God out of the Pledge of Allegiance?"